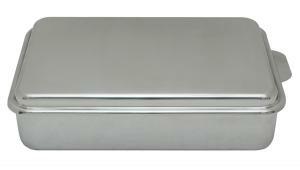 We LOVE this all stainless steel covered cake pan! We use it to transport or store cupcakes and cake as well as to make and store lasagna. 10" x 13" x 3-1/4"